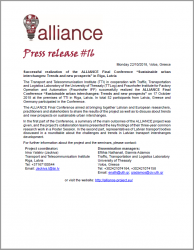 The Transport and Telecommunication Institute (TTI) in cooperation with Traffic, Transportation and Logistics Laboratory of the University of Thessaly (TTLog) and Fraunhofer Institute for Factory Operation and Automation (Fraunhofer IFF) successfully realized the ALLIANCE Final Conference “Sustainable urban interchanges: Trends and new prospects” on 17 October 2018 at the premises of TTI in Riga, Latvia. In total 52 participants from Latvia, Greece and Germany participated in the Conference. The ALLIANCE Final Conference aimed at bringing together Latvian and European researchers, practitioners and stakeholders to share the results of the project as well as to discuss about trends and new prospects on sustainable urban interchanges. In the first part of the Conference, a summary of the main outcomes of the ALLIANCE project was given, and the project’s collaboration teams presented the key findings of their three-year common research work in a Poster Session. In the second part, representatives of Latvian transport bodies discussed in a roundtable about the challenges and trends in Latvian transport interchanges development.